Interfaith Volunteers, founded in the community of faith, involves trained volunteers of all ages who pool their energies and talents to assist elderly and disabled adults, to maintain their dignity and independence. As a service organization of neighbors helping neighbors, Interfaith partners with many area agencies to try and meet needs in our community that are not being met. We assist our volunteers and care receivers to improve their quality of life in Jackson County, Wisconsin. Interfaith Volunteers, is a non-profit, 501C3 that relies on the generous donations from our community to provide our services. 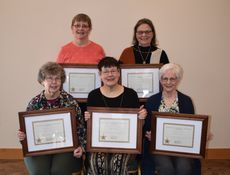 In 2019 Jackson County Interfaith Volunteers celebrates 30 years of helping our volunteers put their Faith into Action! We recruit volunteers to provide services that keep our clients living in their homes for as long as possible. Our services are done by volunteers in the community. Interfaith does not charge for our services, but donations are greatly appreciated and allow us to continue helping others. We work with our community and all area churches to recruit and train volunteers that have a desire to help others, making our community stronger, one volunteer at a time. In celebration of Interfaith's 30th Anniversary we created an annual report, celebrating all of the wonderful years! Click on the picture to view a copy. For more information, download a copy of our brochure. To be added to our mailing list, contact us! We are happy to announce that we are now accepting applications for our annual Women In History Event! Jackson County Women In History is coordinated by Jackson County Health and Human Services, Black River Memorial Hospital, Jackson County Sheriff’s Department, and Interfaith Volunteer’s. To see all past recipients, click here.